About the Comets: The Comets are composed of Blind or Visually Impaired men and women from the Chicagoland area who love to play beep baseball. The team has been in existence since 1995. They are members of the National Beep Baseball Association (NBBA) a league comprised of teams from the United States, Canada & Taiwan. Beep Baseball also known as Beep Ball is similar to traditional baseball, with some modifications. We use a modified 16 inch softball with a rechargeable battery and speaker built in that emmits a beeping sound throughout the game, the "Beep Ball". Our bases are 4 foot high padded cylniders that also have speakers that make a buzzing sound. Because there is varying degrees of blindness ALL player are required to wear an blind fold, thus only using their hearing to play the game. See rules of the game for more details. The Comets are a 501(c)3 orginization. 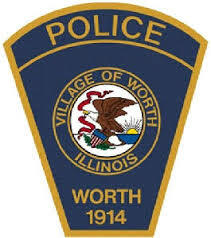 Comets vs Worth Police Dept. How does AmazonSmile work? When first visiting AmazonSmile, customers are prompted to select a charitable organization from almost one million eligible organizations. In order to browse or shop at AmazonSmile, customers must first select a charitable organization. For eligible purchases at AmazonSmile, the AmazonSmile Foundation will donate 0.5% of the purchase price to the customer's selected charitable organization by licking the edit button. 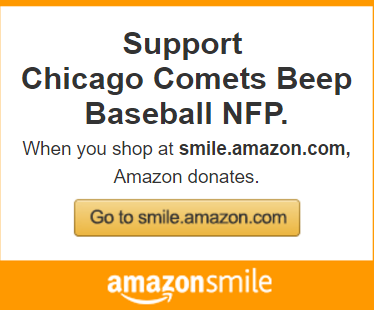 You Can Use your existing Amazon account simply log in to smile.amazon and select the Comets to be the Charity that gets credit.